Grief is weird. I am struck by waves of empathy. When my dad died, the thing that made me cry the most was the thought of what my mother was going through. It was the empathy for her that brought on waves of tears more than anything else. Right now, what brings on the wave of tears is the puppy dogs (not really puppies as they are 10 and 12 years old). They don’t understand why their mom isn’t coming home. They keep looking for her. They don’t understand. You can tell they are sad. We have started to disassemble the house – going through drawers and putting things into boxes – figuring out who wants what. It is a disassembling of two lives and that is sad. Fortunately, this is not my childhood home. My parents moved out of that home at some point while they were still in Kitimat. Then they moved here in 2010. I don’t have childhood attachments to this place. I was struck the day after mom dies that I no longer had to get up to make sure she had her morning pills. My morning routine was mine again. I no longer had to worry about feeding her. Everyone at the house can fend for themselves – and we have a ton of food – as family has brought us stuff. That being said, at some point we’ll want to sit down and eat together again as a family. On Tuesday last week I broke down. I realized that I only had so many mom hugs left. I told mom that morning that I needed a hug and broke down in tears with her for the first time. I will forever remember that hug. We had a couple of other hugs after that, but that was my last big hug from mom. Thinking about it make me cry. 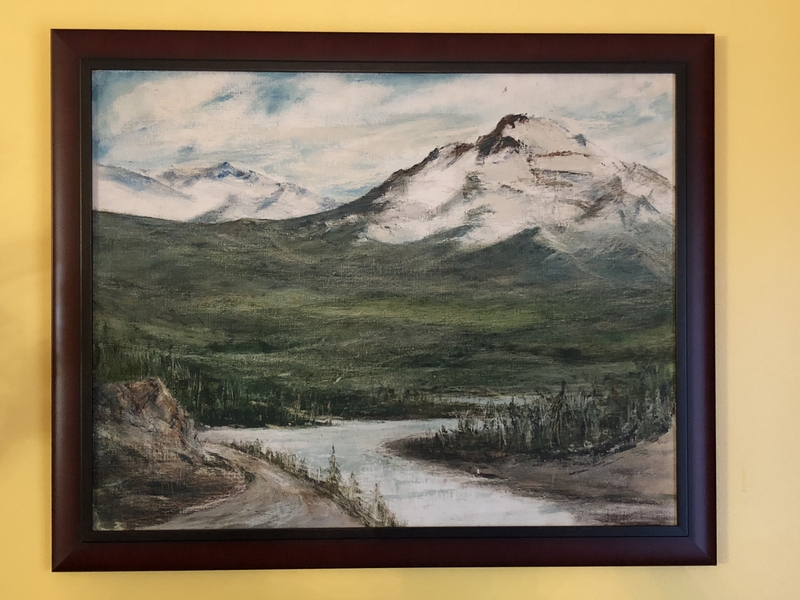 As I write this I am staring at a painting that was done by my great uncle Lem Hogue. The painting is older than I am and hung in my childhood home. I didn’t think I wanted it, but now realize that I do. It holds memories. Interesting how things hold memories. I am thankful for the last three months. I am glad I had the support of the folks at UMB who took over my courses, and the support of my PhD supervisors who understood when I had to pause my dissertation writing to care for my mother. I’m thankful for the time I spent watching movies with her and laughing, and playing “train” (Ticket to Ride on our iPads). I am also thankful that for the last three weeks I wasn’t alone. My husband has been with me here, supporting me, helping me help my mother – and stepping in when I needed a break. Again, he is my rock (and teddy bear when I need a hug). And now I must go and pet the puppies – because they too are experiencing grief – or maybe they are just sleeping in the corning – having come downstairs to be with us, rather than sleeping in the bedroom where one of them still spends the night (the other now sleeps in the hallway outside of mom’s room). Thank you everyone for your condolences, thoughts, and prayers. It is so wonderful to see just how loved mom was. It is also wonderful to know that I have so many supportive friends in my life. Hugs to all. Sorry to hear about your Mom’s passing. Best of luck to you in this difficult time.